So, our old Nintendo Wii had bitten the dust. The disk drive didn’t work, it had taken a beating from being knocked off a shelf of some height (thanks Rachel), there was now a rattling in the case, and there was no power. 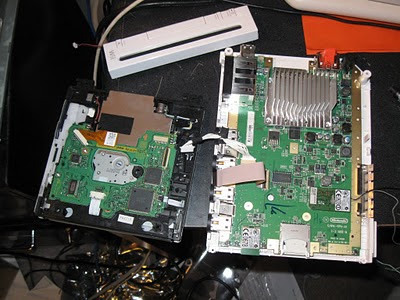 So I did what any sensible geek would do with a device that was out of warranty – I dismantled it to try and find out why it was not working. After taking out the case screws, and taking out the disk drive, the nail that was rattling inside fell out. No, I didn’t know it was a nail before. Again, thank you Rachel! The next thing I do, which I should have done in the first place, got the power cable from our new Wii and plugged that in. Hey! Power! Turned it on, slid a disk in the drive and everything is working well. Well, except that the disk drive sound it like an engine (not good). Granted, it was out of its natural habitat with rubber grommets for shock absorbers. So it was time to put it all back together. I only had 2 extra screws left over. The thing still powered up, so it’s all good. Now we just need to get a replacement for the old power adapter. In any case, I’m selling these for slightly less than what you would get (after taxes) at Wal-mart or anywhere else: $200.00. Contact me, call me, however, if you are interested. Note, in order to take full advantage, you need 3 Wii-motes (one for each instrument).